Results: At Pacific Northwest National Laboratory and the University of Idaho, scientists created metallic-iron nanoparticles with different shapes. This was done by creating the particles at room temperature, instead of the traditional high-temperature method. The shape of the particle affects its chemical and magnetic properties, which scientists are looking to control for potential applications. Why it matters: Oxide and metallic iron nanoparticles have size-dependent properties that could make them valuable in applications such as medical imaging, drug delivery, information storage, and groundwater remediation. This research adds an important tool for tailoring iron nanoparticles' shape and hence their properties. Methods: At the University of Idaho, researchers formed the particles using a sputter-gas-aggregation method at room temperature. The iron nanoparticle is initially composed of zero-valance (metallic) iron. When exposed to an atmosphere including oxygen, a shell of oxide crystals forms around the iron. In addition to influencing the magnetic behavior, the shape of the iron particle greatly influences the orientation of the oxide crystals. This orientation alters the chemical behaviors of the particles. The nanoparticles, which can be made in different sizes from 5 to 50 nanometers in diameter, are so small that red blood cells look like flying saucers by comparison. The particles were then delivered to Pacific Northwest National Laboratory. The particles were examined in the William R. Wiley Environmental Molecular Sciences Laboratory, a U.S. Department of Energy national scientific user facility located at PNNL. In the laboratory, researchers analyzed the particles using transmission electron microscopy, electron diffraction, and Wulff shape construction. "When we started examining the particles," said principal investigator Chongmin Wang, "we noticed these were different from the others we had examined or those reported in the literature, and that piqued our interest." These room-temperature-deposited nanoparticles had three distinct structures. 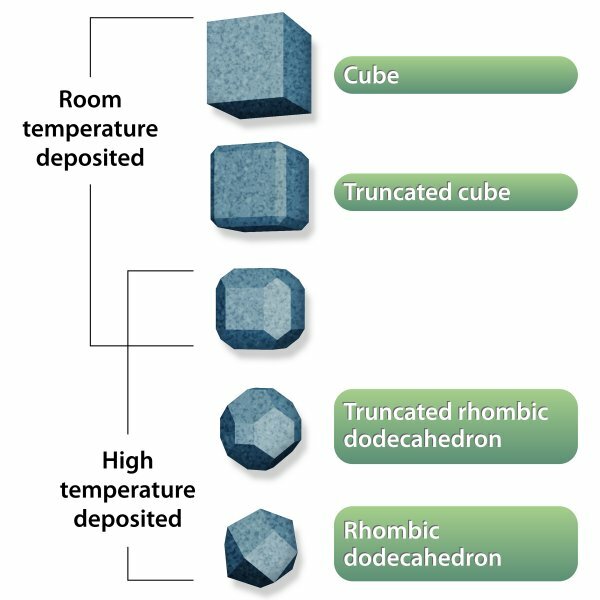 The first was a simple six-sided cube; a shape not seen in high-temperature formations. The second was a truncated cube, which looks like a cube with each of the edges shaved off. 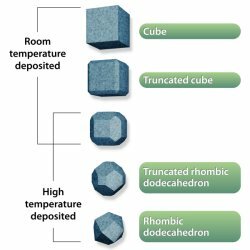 The third was a rounded shape composed of 12 hexagons and 6 squares, a shape researchers have seen when particles are formed at higher temperatures. "These new shapes expose high-energy surfaces to the environment," said PNNL scientist Don Baer. Particles created at high temperatures expose low-energy surfaces. The high-energy surfaces change the reactivity and magnetism of the particles. These results, combined with those already reported, suggest that by using a low-temperature process, the synthesis parameters can be altered to select particle shape with the possibility of optimizing particles for specific chemical or magnetic properties. What's next: The researchers are working to produce enough particles in specific shapes so that they can examine the particles' magnetic and chemical properties. One particular study will examine the particles impact on reactions that remove environmental contaminants, such as chlorinated hydrocarbons, from water. Acknowledgments: The research team includes PNNL's Chongmin Wang, Jim Amonette, Don Baer, Mark Engelhard, University of Idaho's You Qian, and Stanford University's Jiji Antony (previously a graduate student at the University of Idaho). This work was supported by DOE Office of Science, Offices of Basic Energy Sciences and Biological and Environmental Research. A portion of the work was done at the William R. Wiley Environmental Molecular Sciences Laboratory, a DOE user facility at PNNL. Reference: Wang, CM, DR Baer, JE Amonette, MH Engelhard, Y Qiang, and J Antony. 2007. "Morphology and oxide shell structure of iron nanoparticles grown by sputter-gas-aggregation." Nanotechnology 18:255603 (7pp).